Ok so from what I have seen Fallout 3 is really cool to play and looks great. The only problem is that the video card in my system isn't good enough to play the game well :( I need to find a new video card that will do the rest of my system justice. That and have component video out. I'm in the PROCESS of losing weight to get rid of my love HANDLES. Unfortunately this means I need new THREADS. This bad joke brought to you by me. Really is it so hard to understand that e-mail addresses are private things? It isn't like this isn't a discussed topic. But in the past 30 days I had two events where my e-mail address was publicly posted. As this is the internet I must now say that everyone in the world has my address. The worst part was the first one was about some kid in Burkina Faso who was suffering from some kind of horrible cancer brought on my hanging around too much Einsteinium and was going to die and wanted everyone to know it. The second was about a kid that went missing after his parents took away his X-Box asking everyone to help find him even though he was located and it hit the news stream two hours before hand. Ah the fondness never ends. XKCD FTW! Ok some people might think it was foolish to start being the Guidebook Publisher and I laughed at them. This will be easier than I thought! Whoa did I screw that up! I just got the information from the Academic Committee and it consists of 23 files. 10 jpeg files and 13 text documents is what makes their section of the guidebook. Now the interesting part ISN'T going to be integrating all the text files into a single file. Oh no that will be simple compared to the typing of all the 10 jpegs into actual text, they are images of text, and then adding them to the master document. Now I can already hear the wise among you saying "Hey Phalse why don't you just use OCR?" Good question but the problem is that it is all in Greek! That and I don't own an OCR application. Wish me luck on this one. It took about four hours to do the Athletic section which is only 17 pages long. I might be done before next year _IF_ I am lucky. Things have finally settled down enough for me to be able to start blogging again. Things are slowing down around here even though there are piles of stuff all around. The good thing is at least there is a foreseeable end to it all. I'm not sure if I posted about this before, just checked and I did, but I'm now working until the end of the year. The good thing is that it means I'll be staying out of trouble. The bad thing means that I won't be home to unpack crap for the next long while so there will be boxes everywhere for at least a couple of months. The new apartment is looking great so far considering it is covered in boxes. The best part is that we have SO much more room that we might be getting a billiard table to fill the space! The cat seems to be settling down in the new place ok. I can't wait to find the leash so I can start taking him out for walks. I think he misses the amount of natural light the last place got. He is a little squirrely but none the worse for wear. Soon we will have a very happy cat and things will be good once again. For those that missed the fun I had a pilonidal cyst which I think was less fun than possibly doing your own dentistry. I have found new levels of pain in my life and I would be happy to know that I never have to deal with that again. Tomorrow I have a doctor's appointment to find out if I need surgery to see if this actually gets worse or better for me. Worse would be that I do need surgery. After two weeks of getting home care to come over I would really be happy if I don't have to see them again. Ok so it has been a while since I posted I readily admit that. So here is a short post just to keep some people in the look. As noted by my other half, we went to an international conference followed by whale watching for our first year anniversary. This was exciting and interesting. The conference gave me some time to actually explore the city which was easy for the first couple of days but it rained on day three. Ok as far as I know everyone that reads my blog either likes or loves Blizzard Entertainment. Now it looks like they are on the verge of releasing new information about an upcoming game. If you go to the website you are given just a simple jpeg which has been growing over the days. This has been going on for not one, two, three, but four days. Judging by the still incomplete image it will go on for at least a fifth day. People are saying that it will be the news release for Diablo 3 while others are saying new Warcraft. There is lots of guesses all over the web but really for me it looks like they are just creating a new splash screen and seeing what people say. Nothing like a good teaser to get people going. I do have to ask though if it is D3 what is left to do? Seriously the plot is over now that the three prime evils are dead. Sure the Worldstone is destroyed but they could leave that world as is. Heaven help me, Bubbles, and our bank account if it is World of Diablo. A friend of mine went to describe a co worker as "I was always told by my mother if I had nothing nice to say about someone say nothing at all. How are the Blue Jays doing?" Personally at this point I think the same thing can be said of Metallica. ArsTechnica has a review of people doing the pre-release review of Metallica's latest .... effort. Once again they are shunning their own audience trying to make something good out of it. As usual the amount of negative publicity out of this is creating more problems then good. Oh well they will learn one of these days. Maybe when they go back to being a band and not a bunch of money grabbing jerks. You have to admit that there is no better feeling after a long, hot, muggy day that a good cold shower can't fix. For a while now whenever I have had to shut down the laptop it would always do so willingly until the point where it should have powered down the fans and turned off. At that point the system would BSOD and reboot. This naturally made the shutdown procedure a little more complicated than it should have been because I would have to use the power button to turn it off. No more! After installing SP3 and last night's first shutdown it turned off with no BSOD. Three cheers to Microsoft for finally getting it right .... three services packs later and many patches. Where is my linux box? Insert Nelson laugh here. If there are any doubts about it check Dell Hell on Google and you will see some pretty unhappy people. Ok so the conference post meeting wasn't too bad. Out of everything that happened only one person stepped out of line and it was someone's right hand. Over all things were quite civil and it seemed like things were actually getting accomplished. Well this was true until I looked back and reflected on it. Actually out of all the pressing issues they were all delayed to be taken up at the end of the meeting which came early because we ran out of time. So like every other meeting important issues were unresolved. However, this year they will change that and it has been agreed that a meeting take place over the summer to resolve some of the more pressing issues. That will be about as fun as doing your own appendectomy. The good thing about this meeting is that everyone agreed that they will try to step in and help when and where they can when they see and opportunity. This might actually make the conference go better next year or it might make things a complete mess depending on the kind of "helpful" people become. I think it will make a vast improvement to the conference and the year should go better than most. All praise the new conference year! May the year of the joint hosting of schools 10 and 22 be the best yet! Well this year's goal was to spend less time managing the conference and more time enjoying the conference. I would like to post a big "Mission Complete" to that task. This year I had seen at least twice as more this year as I had in previous years. This made it far more enjoyable. I think in the progress of doing that though I might have annoyed a few people. The biggest time saver this year was instead of waiting around for things to be done I just enjoyed the conference. After dinner I then attended to my duties which I normally did over the day. This resulted in much more time away. For the Thursday and Friday days this didn't impact the flow of the conference that much as our committee doesn't actually have a noticeable impact until the very end. Overall I think this year was better than most except for "The Issue" that occurred. Really it shouldn't have but what ever. Each year has an issue just sometimes it is something bigger than other years. The craziness that normally happens in our little pocket on Saturday didn't occur this year. Actually it was quite relaxed. The only problem was that it took a while for us to get the Athletic group out due to an unexpected clause that I missed in the report. Once I got around to that it was quickly fixed. I'm not looking forward to the wrap up meeting this year. To say "fur will fly" and "stuff will hit the fan" I think will be an understatement. Away From Internet. Be back Sunday evening. I have made a couple of changes to the base template. Nothing major really but a good protest against Dilbert.com. The problem that happened is that Dilbert's site went all flash. Now I like flash games but having your main part of the website run as flash is just dumb so I have changed it to the Yahoo syndication. I have also now added "Order of the Stick" which I'm now caught up on. For all you role-players out there I would highly suggest reading the strip. .... to the upcoming conference. Check this out. Ok so I have been meaning to post about this for a while now. As you can imagine after hearing from the newspaper profits that gas will be hitting $1.50 a litre this summer I was shocked. After that wore off I realized they are probably right. This naturally flooded my e-mail over the past little while about "High gas prices" and "Save on Gas" approaches to make things right. Now let me say that in principal I agree with the e-mail. Actually if anyone has watched me over the past few years they would realize that I have been following through with these e-mails. I have been a frequent user of SunCor Energy and have actually avoided places like Esso. Now I realize that the follow website is a bit bias but even if there is a grain of truth, I'm too lazy to confirm myself, to the stuff there then you would understand. Stop Esso, ExxonMobil child company, that some companies are worth boycotting not because of trying to drive down prices but because they are evil. Esso has joined the list of companies that I avoid like Bell (poor support), Electronic Arts (poor employee relations), Nike (child labour) and Walmart (oppresive pricing practices). I'm not asking anyone to follow my lead. These are my choices and if you agree you can follow them but that will be your choice. There is my rant and I'm done now. So it turns out that we found a recipe for cooking home fries. Naturally you can't very well have a meal consisting of just that so I thought I would check out how well my omelette skills are. Well they aren't 133t but they aren't that bad. 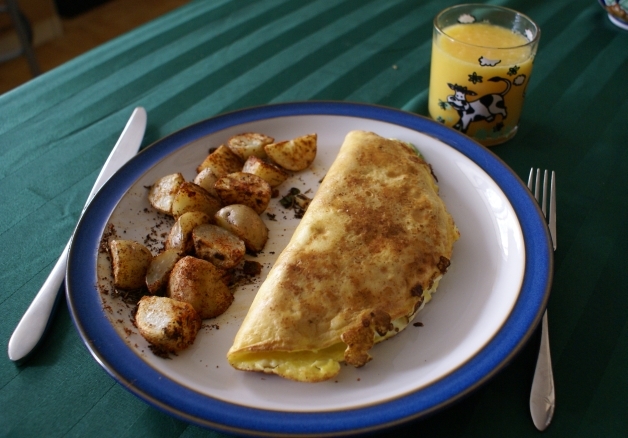 I settled on a green pepper, green onion and feta omelette for food. Let's just say I wish I could eat like this every day. Ok I have been planning for a few years now to redo the entire report generator and I have finally done it. It took a lot of side work for the past few months but it is done. I have also compared it to some of the results from last year to see if it is functioning properly. With all those changes the report generator which, from what I recall, took minutes to run is now down to 26 seconds for all reports. This includes the most difficult and twisted ones. This should make our job much easier when it comes time to actually use the report generator. Out of everything listed there I'm not done with it though. Right now it is set to a static database which I need to change to something more dynamic. I'll be including a standard open file dialog box for this use. After that I'm not sure how much more I need to do to make it a better program. The reports are nice and snappy and still accurate so what can I do? Actually there is two things that need to happen. I need the full documentation of all the reports to make sure that what I am generating is what should be generated. I did find a fault in the previous version of the report generator though. The swimming award doesn't work and from what I can see never did. I'm not sure what I was generating in previous years but it isn't want they wanted LOL. Update: It seems my understanding of the report was incorrect. The design of the tables involved were very flawed. Enough that they shouldn't have been published like that in the first place. Anyway a new table will be introduced that will help slipstream the process and make it faster than before. To relax people let it be known that the system before was completely functional just very clumsy. If I wanted to go to Vancouver and back again I wouldn't take a cruise ship to get there I would take a plane. Both will get you there one will just take longer. I'm not sure if it is the real truth or just a convenient truth but it is something. At last I have a reason why my employment was not continued. It seems that I wasn't "management enough" to be able to stay there. Considering the way that people were talking I'm not sure if this is the real reason but it is something closer than anything else that I have heard. The only part that makes this funny is I'm not sure if my boss actually knew that was the reason. I'm not sorry to go though. The place was nice but I did start to notice some undercurrents throughout the company that I'm not sure I would have enjoyed. This saved me time about what was going on. Also the release resulted me in not having to drive through way too much snow. The other advantage is that I really don't want to be management at this stage of my life. I enjoy what I do right now and I'm not sure I could step away from that to be able to do more. I'm a System Administrator and I'm happy with that. "Thanks a lot for your assistance in the past, and if need be in the future. The only person that was here to provide stimulating conversation is no longer - you. Days and afternoons will be boring now. I do wish you all the best that can possibly come to you, and that you find deserving employment soon. I am sure that my surprise was equal to yours on Friday, but I guess the "perfect fit" was more important than an individual who was willing at all times to assist, and one who had work ethics similar to mine. I am sorry for their loss - not yours. Keep well and good luck." I think that is the nicest thing anyone has said to me after I have left a company. Ok I have my domain back and it is actually working. I have been responding to various e-mails and what not since it has been back online. As most people know when you first get a job there is a certain probation period that you are in where both parties have an option of ending the working relationship without notice or reason. Well Monday would have marked the passing of that time at my employment but it seems I won't be there to see it. As management said they didn't think I was the "right fit" for the company. So I'm out looking again for employment and we shall see how that goes. Anyone know of a company hiring a Windows System Administrator? If anyone wants to see my public resume you can find it here. Looks like my domain is still in limbo. It is back online. I guess the domain transfer from my previous provider to the new one went well. I'm going to be testing the accounts tonight to make sure everything is backup up ok. I would just like to inform everyone that today reaches a bit of sadness that I have been expecting for a while now. My very first e-mail account has been closed. This account has been with me since I was in grade 8, for those mathematically challenged that makes it about 15 years. The service from the provider eventually forced me away to find greener pastures. Because of this change please be aware that all my domain related accounts will be inactive for a week as domain ownership moves from my previous hosting service to my new one. At one point I can actually say I was a proud member of the internet community through the host but as they grew bigger they also grew less feeling to the community around them. I liked the idea of getting messages from the president every Christmas season wishing everyone a happy _______, the greeting was in about 20 different celebrations. I liked the idea that they would work on firming up the local infrastructure by connecting directly with other ISPs to create a bigger web then relying on the local major providers. But alas all that has passed and with it I sign my first e-mail account to the eternal ether and hope that things get better from here. As promised here is the post about "Management's spin on bad ideas". I found out though some accidental cyber stalking that one of my previous managers listed quite a number of interesting achievements from the company he left. The most interesting of them is the fact that he managed to "Lead initives to outsource email management". This on it's own seems like a great idea. A medium sized company now allowing a third party to offload some of the IT processes and freeing up staff to do more worthy things. Let us look under the covers just a little first shall we? The company in question had a well established e-mail system in place prior to his arrival. The processes in place to be able to manage the previous mail system were well defined. The Linux administrators made sure that everything was up to snuff and working on a shoe string budget was more than possible for them. They had the mail server working with over 300 users on a small little P2-400, I believe, with a paltry 64 megs of ram for the longest time without causing any issues. So what happened? Why did such a good system get thrown out and replaced with a Microsoft Exchange system? The answer is simple. After a select removal of staff, me, the rest of the staff saw little to no reason to say and starting looking for new places of employ. The two Linux administrators that were there left with little time between them. With no administrators for the mail system something had to be done to keep the world turning? The solution was outsourcing the mail services to someone who could handle the problem and do it quickly. It was done with I'm guessing with some issues but a mostly transparent transition from one system to the next. The manager was undoubtedly hailed as a hero for another successful project. The real problem. After successfully destroying a great IT group for selfish and misguided gains the manager managed to incur an on going expense to the company because of his inability to lead. As a footnote it seems that said manager has yet to hold a job for more than a year and a half anywhere he goes. In a way I think I may continue the quiet cyber stalking. Should I ever be in a position where I can hire someone it would be good to use the Internet to find out how some of the IT community works. There are good people out there that shouldn't have to deal with people like him.